This utility is an add-in (.xla) programmed in Microsoft® Visual Basic® for Application (VBA) that creates custom shortcuts on the Microsoft Windows® environment to XL files opened on the Microsoft Excel®. See the pictures below. It consists of only one file, the CreateShortCut.xla, which is about 250 kb in size and can be installed automatically using one of the installer package files available below to download. You also can uninstall it automatically using the same installer file, leaving no mess on your Windows Register or disc. - The shortcut can open the XL file on a new Excel instance or on already existing one. - Shortcuts can have custom icons on your choice. - Shortcuts can be created on Desktop, on any other folder of Start Menu, and on any other folder on your choice. - The shortcuts can be set up with EXCEL.EXE command line options. - Create shortcuts since the Windows 95 upto the Windows 8 with or without WScript installed. - The CreateShortCut.xla installer does not modify Excel menu structure or result in the utility being opened every time you run Excel. 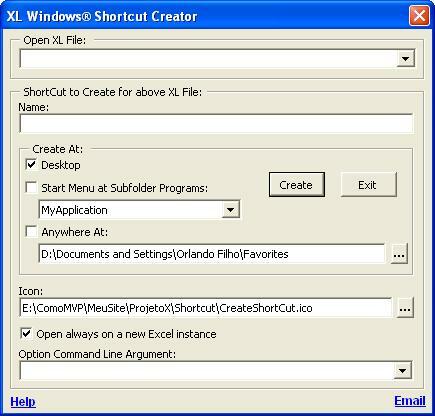 Instead, CreateShortCut.xla should be launched by the shortcut created in the Windows environment or directly from Windows Explorer only when your XL file is already opened on Excel. - In one run is possible to create shortcut for one or more XLs already open on Excel. Note: The above link downloads the installer and uninstaller package programmed in VBA in a XLS duly converted to EXE by the XLtoEXE to make the installation easier for macro and Microsoft® Windows® laymen; however, if you're an expert and for some reason prefer an installer and uninstaller package in open ZIP format, click here. With this zip package you can install it in three ways: (1) Simply initiate the Install.exe that loads the same XLS in Excel without macro alert; (2) Extract the entire package to a folder and initiate the XLS, enabling the macros in Excel and using 123 as password, or (3) Install the XLA manually or until run it without install.